Testing the image circle of a lens is rather simple with a test projector but it can be somewhat subjective. There isn’t always a clearly defined hard end to an image when evaluating for coverage. Sometimes a little bit of light falloff is acceptable. A natural vignette can be pleasing but it can also blend into the limit of a lens’ image and make determining maximum coverage rather difficult. I’ve spent years compiling a list of image circles based on my own subjective opinion which was met with great thanks by most – but there has always been the inevitable email or phone call from a disgruntled cinematographer who was disappointed to find that a lens clipped a fraction of a millimeter into the frame of their image despite my records. There are variables, of course, in any analog assessment such as this. Because of this, Duclos Lenses has developed a tool that records the image circle of any lens, saving a reference image for individuals such as yourself to determine to what degree the light falloff is acceptable. This has been a project I’ve been working on for a long time. With the help of our engineers and some back-end support from Phil Holland, I’ve finally been able to complete this tool. I’ll be recording as many lenses as I can in my spare time (who am I kidding… I’m neck deep in lenses and have a one year old daughter) to provide the most usable, comprehensive database of image circles for the industry. The ICE Box test bench in it’s early prototype form. 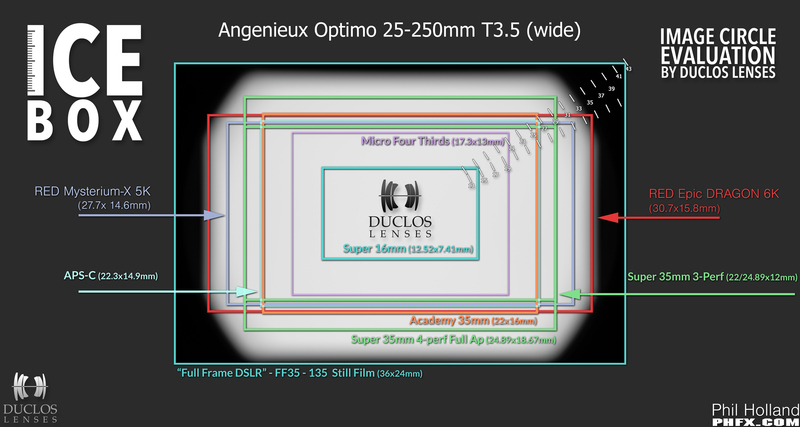 A bit of housekeeping here: I chose a 24x36mm maximum because it will easily demonstrate all of the relevant cinema formats including Micro 4/3, Super 35, Red Dragon, Vista Vision, and everything in between using the integrated scale. Sure there are larger cinema formats (IMAX, Alexa 65, etc.) but those are very specialized and lenses for larger formats are not common by any means. Because lenses are designed specifically for these larger formats, you know they’ll work on those and anything smaller than the format they were designed for. A sample test result showing various formats as well as the manual diameter rule. As you can see, this brand new 25-250mm Angenieux Optimo Style lens will just barely clip the Red Dragon 6K frame on the wide end of the zoom. I’ll be adding my results continuously once I find a permanent home on the web. Check back for a link to that location soon. Feel free to share this post with anyone and everyone or even download the results from a specific lens test. I’m all about sharing knowledge. Enjoy! Matt, any chance you could start adding Flex 4K sensor to these? Maybe. But thats what the general ruler is for. You can determine any sensor coverage with the ruler in the top right corner. Three highly popular frames are missing above – the GH4 4K mode at x2.4 and the Black Magic Cinema and Pocket cams at x2.3 and x2.88 respectively. Thats fine. I’ll be adding a list of sensor sizes snd they required inage circle. The ruler in the top right will allow you to check coverage for any sensor or format. This way it never has to be updated with ever changing sensor sizes. I have to say I love the image of you neck deep in lenses! Can you please arrange that as an image for your website? Could I suggest you colour-code the falloff in 1/10 stops? For measuring, it would help if you had a centre cross to measure from. Tom, the scale in the upper right shows exact diameter. Center point isnt necessary as our ICE Box is very accurately tuned. Matt, this is a great resource, can’t wait to see the library expanded. Your hard work and dedication is much appreciated! Since no one else has said it… THANK YOU!!! I have ended up with a Red Scarlet/Epic Nikon Lens Adapter New never used if anyone interested? Nice diagram – really helps to visualize what’s going on. Have you had a chance to test the image circle of the Sony CineAlta primes (20, 25, 35, 50, 85 & 135mm)? It says they are designed to work with F5 & F55 (25.95mm), but I’m wondering if they conform to larger “traditional” super35 sizes – such as 3-perf (29mm), even 4-perf (31mm) or the new URSA Mini (29.08mm).